The experience of art takes place between the audience and the work, and each exhibition arguably manifests itself only in the presence of the visitor, the works becoming transformed by this experience. This is particularly true of current exhibition Trove, Dorothy Cross selects from the National Collections sponsored by BNP Paribas, where Dorothy presents us with a series of objects and artworks that may appear to have no immediate connection. There are no labels, no room titles, no logical connections, leaving the visitor to discover and explore, making your own personal and sometimes strange connections between works. IMMA, like most art galleries, has a team of mediators that you see on every visit. Hugely knowledgeable about art in general, and each exhibition in particular, the mdiators regularly give talks and tours to the public and are an invaluable support for the visitor should you wish to chat to them, and many do. Mediators are witnesses to this very transformation, and we’ve asked one of our team, Barry Kehoe, to tell us a little about his experience of this during Trove and what questions visitors raise. We quickly find that there are so many questions…. Trove ends on sunday 8 March 2015. Admission is free. 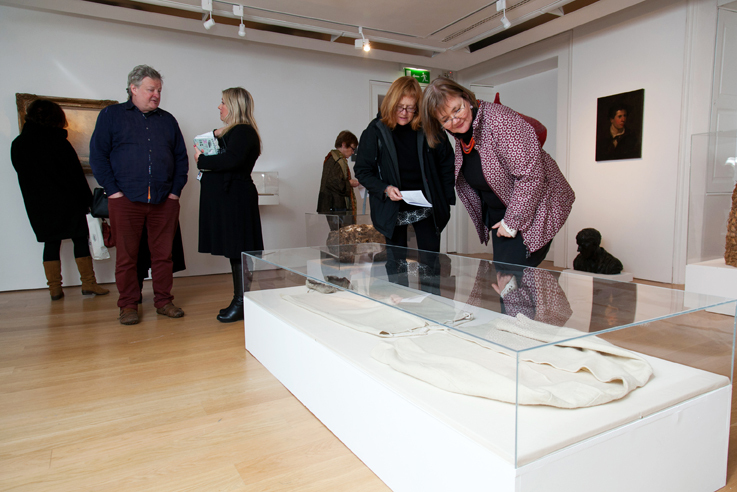 Listen to a brief introduction from IMMA Director Sarah Glennie. 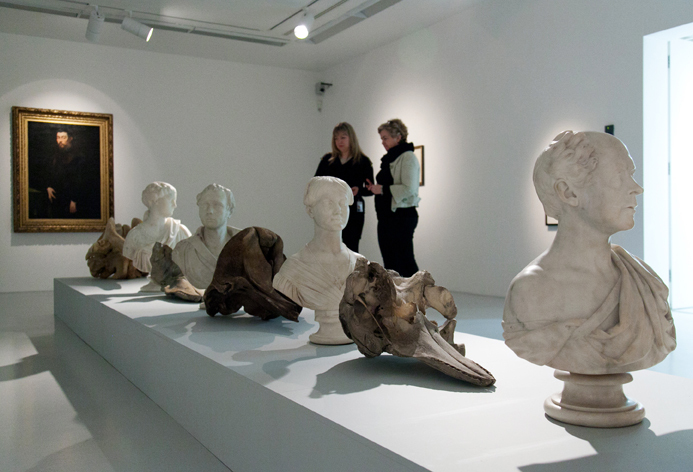 It may seem like a peculiar job for some, the role of a museum invigilator. It takes a certain kind of patience to sit in a gallery space for long hours, protecting the precious art objects from the absent minded hand of a visitor that may at any moment reach out and touch that which must not be touched. 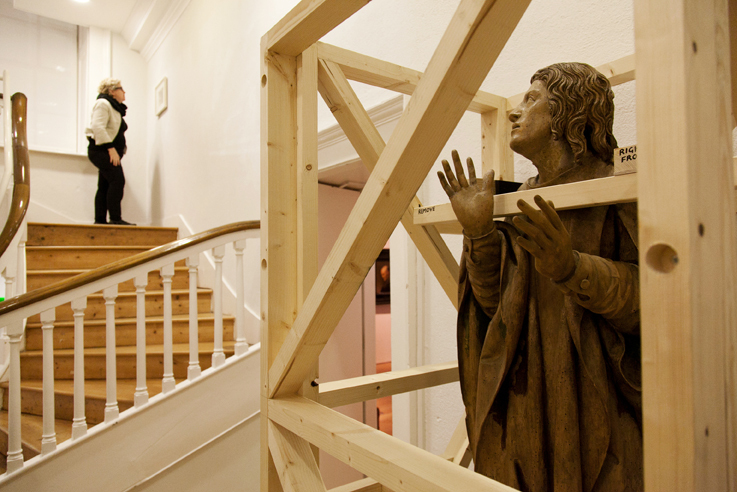 In IMMA those of us who invigilate are called Mediators, a team comprising of artists, art historians and many other varied areas of art expertise. The expert knowledge and experience of the gallery staff is of significant importance as we are not just there to protect the artworks we also act as a bridge or conduit to mediate between the art works and the visitors. The Mediators facilitate talks, tours and workshops for the education programmes engaging with visitors from knee high to 90 and upwards. On occasion there are opportunities to work on exhibitions as they are being formulated and installed but more often than not we only get to see the exhibition a day or two before it opens to the public. So as we sit silently in a corner, the mediator, though at some level an informed expert, is also in many ways a visitor to the exhibition. When an exhibition like Trove opens the mediators are as much a part of the exhibition as the objects, artefacts and artworks that have been gathered together in the gallery. We live in the spaces along with the artworks for the duration of the exhibition and have the opportunity to contemplate the artworks, study the exhibition as a whole and observe the visitor experience first-hand, gaining many insights that only long exposure and slow viewing can achieve. This is an advantage and a luxury that most visitors to the museum cannot enjoy due to the constraints of time. Research has shown that the average amount of time spent in front of an artwork varies from 15 to 30 seconds. A recent article by Stephanie Rosenbloom in the New York Times titled: “The Art of Slowing Down in a Museum“, suggests one method of putting on the brakes is to take a public tour. If this is felt to be too formal there is another approach. Quite often an artwork or an exhibition demands more than just to be observed and this seems to be the case with Trove. Many visitors are prompted to spontaneously initiate conversations, expressing how they feel about a piece or to ask a question about a particular object. Simply engaging in a conversation with a mediator can often be the best way to enhance the visitor experience of the exhibition. Barry Kehoe is an Independent Curator and Art Writer. He also works in the Irish Museum of Modern Art (IMMA) facilitating talks, tours and workshops for the museum’s various education programmes. He holds a BA in English and History (UCC); an MA in Drama and Theatre Studies (UCD); a higher Diploma in Arts Administration (UCD); A Certificate in Journalism (City and Guilds) ; A Certificate in Drawing and Visual Investigation (NCAD); and an MA in Visual Culture – Art in the Contemporary World (NCAD). While also performing in the fields of Music and Fine Art Drawing Barry has written for various visual art publications including the Visual Artists Ireland – News Sheet, Art in the Contemporary World, Critical Bastards and the MART Gallery. The featured image Reading Ulysses (2006) comes from a solo exhibition of Barry’s drawings shown in the Signal Arts Centre in Bray, Co. Wicklow in 2006.